Focus On Murdochs Shifts: Were They Bamboozling British Politicians? : The Two-Way At a London inquiry, the media moguls are facing questions about whether they have been trying to strong-arm politicians into supporting their bid to control BSkyB, the satellite broadcaster. Half-way through today's hearing in London into the Murdoch family's "scandal-tarred British newspaper unit," and the ethics of British media outlets, the inquiry's focus has shifted, NPR's Philip Reeves reports. 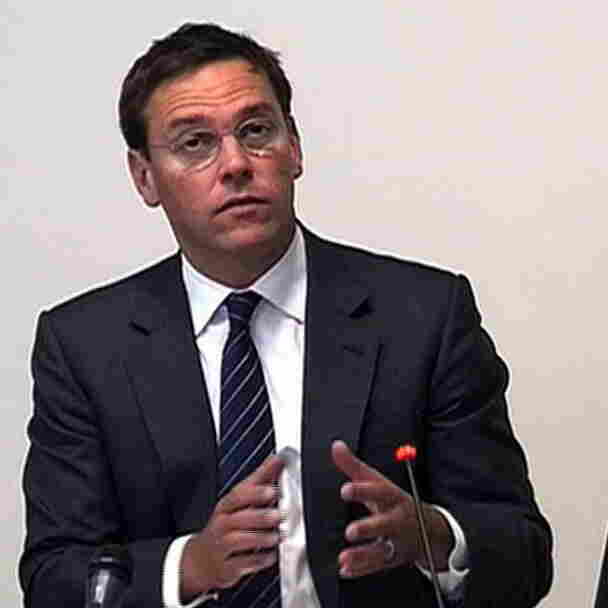 A video grab from pooled footage taken inside the Leveson Inquiry shows former News International executive chairman James Murdoch giving evidence at the High Court in London earlier today. The "underlying issue" that's now of most concern to investigators, he said earlier on Morning Edition, appears to be: "Did the Murdochs use their power as media barons to try to strong-arm British politicans to agree to allow them to take total control of BSkyB," the British satellite broadcasting giant. James Murdoch, son of News Corp. CEO Rupert Murdoch and a top company executive himself, is facing many questions about his many meetings with top British politicians in recent years, Philip says. And while James Murdoch has been saying that the get-togethers involved nothing more than the normal advocacy that any executive would do on behalf of his company, the issue is whether they amounted "to bamboozling by media moguls of politicians who are very eager to stay on their right side," Philip says. The chief attorney for the inquiry, Robert Jay, "noted that Murdoch met repeatedly with Prime Minister David Cameron and other key Conservative Party officials at which he advocated News Corp.'s takeover of BSkyB. Jay tied the Murdoch newspapers' endorsements for those conservatives to the politicians' subsequent support for their bid. That bid was abandoned at the height of the hacking scandal last summer." David, by the way, is tweeting as the hearing continues. Rupert Murdoch is scheduled to testify Wednesday. The News Corp. scandal, as we've been reporting for nearly a year, began with word that one of the company's tabloids — News of the World — had hacked into the cellphone of a missing teenaged girl (who later, it was revealed, had been murdered). Since then, evidence has emerged that the practice was far more common than realized. One related issue is whether James Murdoch did or did not know how common it was for his company's newspapers to do such snooping.